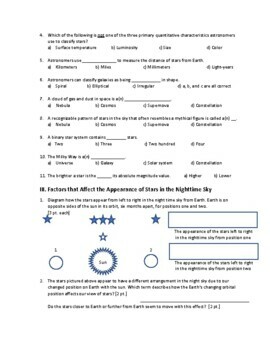 This listing features a four-page exam about stars and galaxies for a middle school astronomy unit in an Earth Science course. 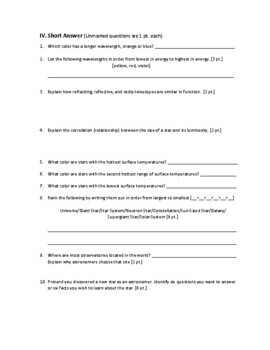 Since this document is editable, you have the option to change the title and point values of each section and use this resource as a summative study guide instead. Explain how a refracting, reflecting, and a radio telescope are similar in function. Where are most observatories located in the world? Explain why. 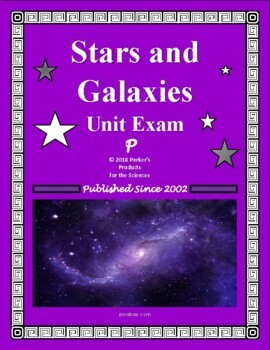 Rank the following from largest to smallest……Galaxy, giant star, neutron star, universe, constellation, solar system, etc. You discover a new star. State six questions you would like answered about this new star. This activity comes with a four-page key with the answers in bold red font. 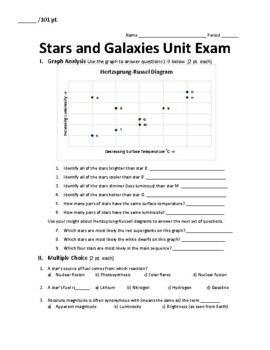 This study guide/assessment about stars and galaxies complements the “Stars and Galaxies Crossword Puzzle Bundle” and the “Star Life Cycle Cryptogram Puzzle” activity in my store. Check out my store for dozens of other quality field-tested, innovative, practical, and user-friendly science products for several fields of science - biology, chemistry, field ecology, physical science, Earth science, and human anatomy and physiology. My store is inundated with cryptogram puzzles, crossword puzzles, vocabulary madness tournament bracket challenges, Latin/English root word conversion activities, color-plating activities, classification quests, fill-in-the-blank guides with word banks, study guides, homework quizzes, unit tests, and other helpful miscellaneous resources. I began launching my curriculum line through TpT in 2018. I have over twenty years of teaching and curriculum writing experience as the department head. I joined TpT with seventeen years of publishing experience.